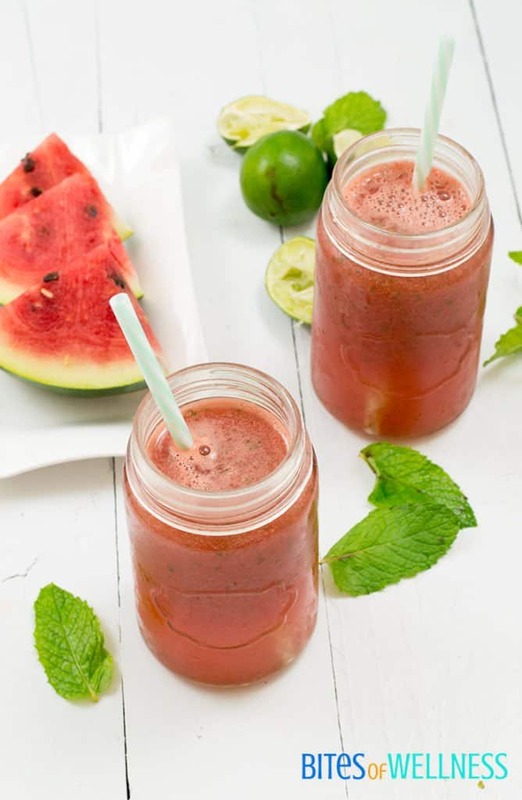 Cool off this summer with this Watermelon Mint Mocktail. Just as refreshing as your favorite cocktail but you can enjoy this anytime! 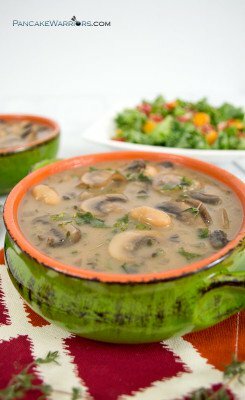 Vegan, paleo, gluten free and only 3 ingredients! The perfect summer treat! Dave and I moved to Austin TX in August last year. It was hot but it rained for most of August, so the heat was not as intense as I expected. This year though, holy moly it’s hot here in Texas! I’ve realized that just driving my car to the gym dehydrates me! So focusing on my water has been a priority. But let’s be honest, drinking water 24/7 gets kind of boring. 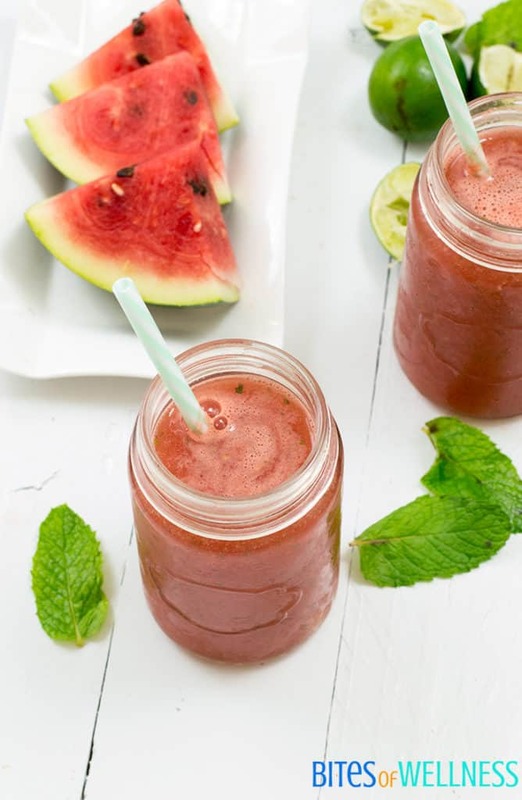 But this watermelon mint mocktail is the perfect compromise! It’s refreshing, hydrating and so delicious. Right now you can get super ripe yummy watermelon for almost nothing. So here is a tip, buy an extra watermelon and while your cutting board is already messy, cut up a second watermelon and freeze the chunks in a freezer bag. I promise you won’t regret taking the extra few minutes! 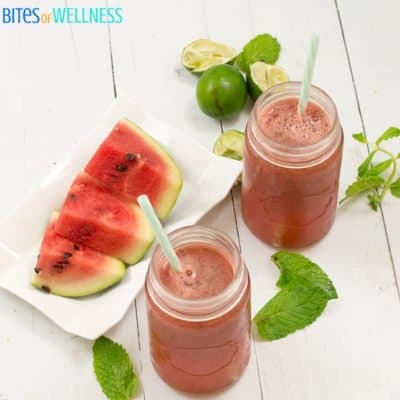 You can use the frozen watermelon chunks instead of ice in your water or you can make this refreshing watermelon mint mocktail. This watermelon mint mocktail reminds me of a naturally sweetened mojito! Who doesn’t love a good mojito in the summer heat? The best part is that it’s so easy to make! 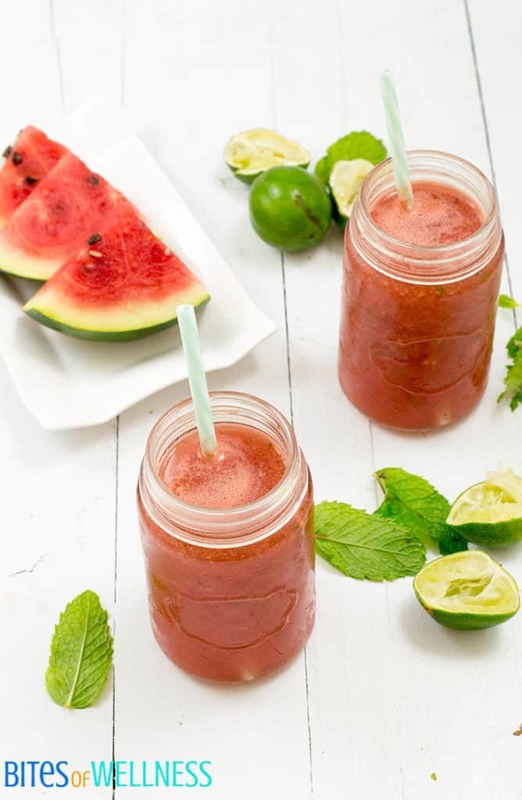 Just blend frozen watermelon, fresh mint and fresh lime juice in the blender with water, and serve immediately. You can also pour the watermelon mint mocktail into an ice tray and freeze to enjoy later as well! I love using these little ice cubes in my water to flavor it throughout the day. Need other ideas on what to do with your leftover or extra watermelon? You can try this watermelon gazpacho or watermelon feta walnut salad! PS if you wanted to use your frozen watermelon for a refreshing adult beverage, you could try this Skinny Mini Watermelon Margarita as well! Cube watermelon. Place in ziplock bag and freeze. 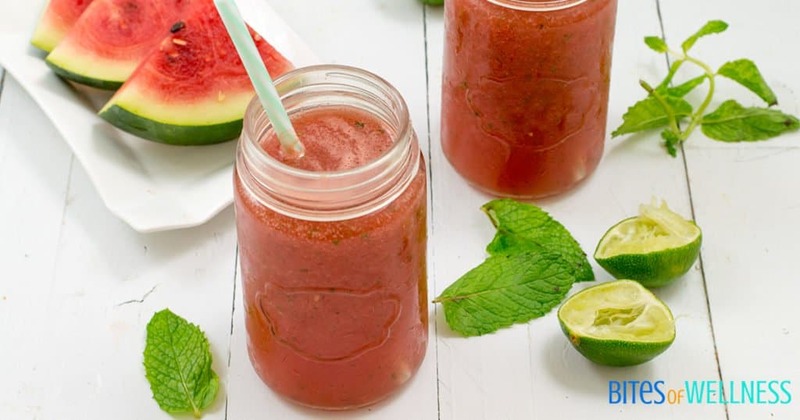 Place frozen watermelon, lime juice, mint and water in blender and blend until smooth. 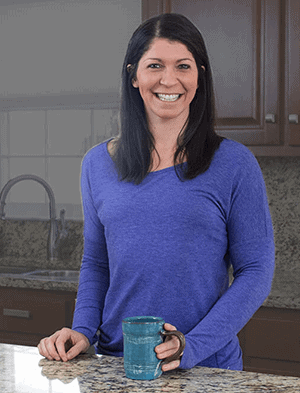 Pour into glasses and serve immediately or pour into ice tray and freeze for later! Watermelon is super hydrating so it’s the perfect summer food or drink to replace water sometimes. Amazing idea! Would love to try one as never did in my life before 😛 Maybe tomorrow I’ll try to prepare one, thanks! 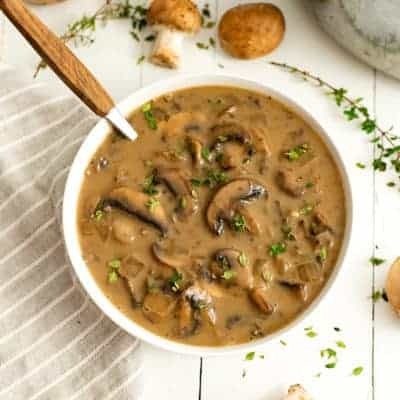 Quick and easy, love it! Mmmm…. this is a great use of watermelon! It looks so refreshing. Perfect poolside sip for a hot summer day. So yum! The adults and kids loved this!!!! This looks super-refreshing. I’ve got loads of mint growing on my patio and we’ll start getting watermelons in our farm share soon. Now I’ve got a great recipe to use both! These look totally refreshing! I love watermelon. SO delicious and refreshing! A good excuse to buy a whole watermelon! !